RIMS Ranchi Recruitment 2019: Rajendra Institute of Medical Sciences, Ranchi / www.rimsranchi.org is conducting recruitment processes to fill 362 vacancies. As of now, there is one recruitment drive going on for 362 Staff Nurse Posts. RIMS Ranchi Recruitment 2019 - Job notification for 362 Staff Nurse Posts in RIMS Ranchi, Ranchi, Jharkhand. 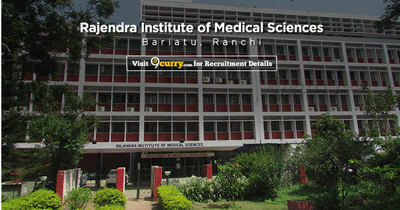 Applications are invited by Rajendra Institute of Medical Sciences, Ranchi on or before 30 Apr 2019 05:00 PM for 362 vacancies.